The Arturo Fuente Anejos #60 is tagged with free shipping. If you order this product, your entire order will receive FREE BCP Ship Saver shipping! 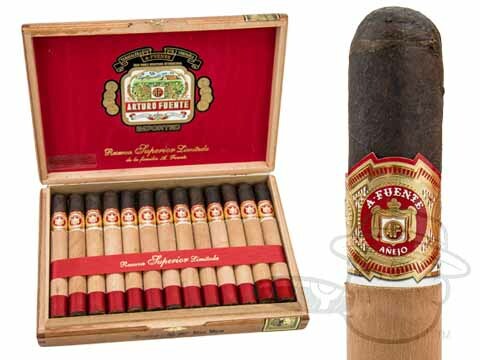 Arturo Fuente Anejos cigars are essentially the Maduro-wrapped equivalent of the famous Opus X blend. The smoke is nothing short of profound; notes of chocolate, coffee, and boozy sweetness radiate from the Maduro wrapper leaf, which has been aged in cognac barrels for several months. The Dominican binder and filler grown at Chateau Fuente add pepper and cedar notes, along with many subtle nuances that make this one of the most complex smokes available. Good draw, burn , flavor and finish. Really enjoy this cigar. Wish they were available year round. Seems like the draw would be minimal, but what a pleasurable smoke. Can’t wait for the next one. Arturo Fuente Anejos #60 is rated 4.9 out of 5 based on 3 customer ratings.